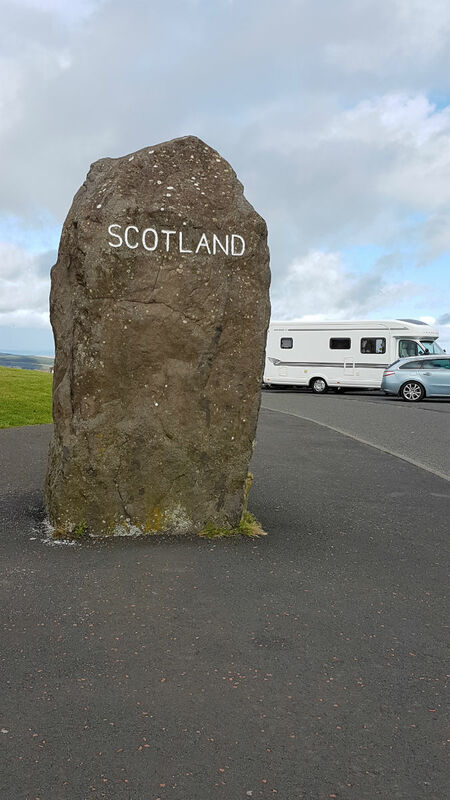 We left Scotland in convoy with our friend Mary who travels solo in her lovely Hymer motorhome. We had planned a trip to show her the ropes of motorhoming in France and beyond and to offer a bit of companionship on her first trip abroad in the van. Now that we live in the south east of Scotland we get into England quicker than before but we soon discovered that the route down the A68 was to be fraught with complications. We were approaching the border with England when a loud crash from our fridge followed by the unmistakable sound of its contents flying onto the floor caused us to utter the first, but definitely not last, blood curdling curses of the trip. Fortunately they kindly provide a viewpoint at the border and we could pull in there to investigate. One of the shelves had fallen out of its catch causing a deluge of boxes and jars to fall down, press on the door that we’d forgotten to lock and … you can imagine the rest. Mary hopped in to help and we managed to get the shelves in with the clever but inadequate plastic catches fixed the right way up … ok I admit it, I’d put them in upside down. They work a lot better the right way. I then replaced all the contents, made a mental note not to open any beer bottles for a few days, locked the fridge and we were off again. Our first planned stop was Dobbies in Ponteland where we would eat scones and drink coffee, conveniently forgetting the solemn promises we’d made to ourselves that travelling in a motorhome would make paying other people to provide our coffee unnecessary so we were bound to save money. Mary’s new satnav had been carefully set to the post code for Dobbies in case we should become separated and we bowled off south with not a care in the world. Ha. Just before the point where the A68 turns right and we would take the A696 towards Ponteland we saw a huge sign. A696 closed! What? Mary was following close behind and we had warned her against turning down the A68 at that point because it’s a mare of a road. Oh dear. We had no choice but to do a series of flashes and indications and then turn right just as we’d told her not to. Of course Mary is an intelligent woman and she saw exactly what was happening but not being familiar with the vagaries of sat navs had to put up with it sobbing and pleading with her to turn round, turn left etc. etc. for about forty further miles. We stopped at a different place for coffee and being stressed, later than planned and hungry, turned the stop into lunch. That night we stopped at a pub in Yorkshire that offers free overnight parking for motorhomes with an expectation that you buy at least a drink if not a meal in exchange for their hospitality. I’m not going to give its name and location here because I’m going to be honest about the food and another person on another night with a different cook might have an altogether different experience. We pulled up into the carpark where a sign gave a jolly welcome to motorhomes. After a short while a lady appeared out of the pub and greeted us warmly, telling us that the bar opened at 5 pm and that food was served all evening. We were hungry by the time we strolled in at 6.30 p.m. and we examined the menu with great anticipation. It seems that Wednesday evenings have a special meal for £5 but we decided to push the boat out, forgoing the burger and chips and choosing instead the half chicken and chips. There’s no way of saying this politely – it was awful. The chips tasted of old and possibly not hot enough oil and the chicken was dried up and tasteless. We soldiered on, trying to find something positive to say and ended up putting chunks of chicken in napkins to take back to the dogs. We then made our first error – we assumed that even though the main course wasn’t good the dessert would be better. Out of three one was good – my sticky toffee pudding, one was mediocre – Mary’s bakewell tart and custard, and one was truly awful and that was Shirley’s … a huge slice of cheesecake that appeared to be thickened with cement. We then made fatal error number three and ordered coffee – it was brown and that’s where the similarity ended. On a positive note the beer was good so we decided that if we were to visit on the way home we would eat in the van and go in for drinks and a game of pool. The parking area was flat, services of water, waste and toilet emptying free and there was even a toilet and shower. I really hope that it was just that the chef was off sick because the place had everything going for it except the food. Nice level free stop behind the pub. The next day found us rolling south to our next stop at Lyndon Top by Rutland Water. This place is on our list of favourites. It consists of acres of manicured open fields, loads of water points and a couple of chemical toilet disposal points. It looks out over Rutland Water and it is completely relaxed. You can park where you like, in whatever direction you like and no-one will bother you. Grey water is dumped in the bushes and there is little to do except breathe the fresh air, go for a walk or, if you don’t want to cook, get a take away delivered. We were met with a friendly welcome, walked the dogs and settled down for a relaxing evening. The cost is now £10 a night but for that you can stay the next day up until 9pm in the evening. For those looking for a more active break you can go fishing on the water, play golf next door or cycle around the lake on properly made up cycle paths. The next morning we were off again, bright and reasonably early for our longer and more stressful drive to Canterbury Park and Ride where we would spend our last night in the UK before getting the tunnel to France. The deal here is that you can stay overnight in your van for £3.50 a day and this includes unlimited use of the park and ride buses into the city, water and waste services and a safe and flat overnight stay. We discovered this time that when you stay over you must pay for two days making an overnight £7 but it is still a bargain. We spent Saturday morning strolling the sunny, bustling streets of Canterbury and then visiting the famous Cathedral where we were truly blown away by all it has to offer. Fascinating history, some wonderful modern art work and brilliant guides who will answer your questions and give freely of their time to make your visit worthwhile. The place is full of atmosphere and energy with something for everyone to enjoy. It was getting dark when we left the tunnel and headed to our first stop for the night. We chose Watten Aire de Camping Cars and pulled in there 45 minutes later to find one space available. Fortunately it was just about big enough for two vans and we shoehorned ourselves in, cheek by jowl, shared some crackers, cheese, paté and tomatoes before falling into bed exhausted. We sleepily agreed that everything would look better in the morning and we were right. It was Sunday Bunday when we woke up. Shirley and Mary went to the boulangerie in the morning sunshine, along the banks of the canal and brought back delicious cakes, a French stick of bread and tales of a lovely environment. Watten Aire is a great spot if you need somewhere within an hour of Calais or the Eurotunnel. The small town has everything you need, including a couple of café bars, a restaurant, a few shops and an old church and a windmill both floodlit at night. Close to the northern French border the buildings are distinctly Flemish in appearance but the roads are thankfully much better than Belgium … the land that tarmac forgot. We were quickly settled in the Aire, neatly placed beside the canal with lovely views over the water to the town. Mary got out her sketching gear and folding chair and went off to the canal side to start her very own record of the trip. We resorted to our standard touring mode of people watching. We were surrounded mostly by Brits and Shirley, the People’s Friend, trotted outside to strike up a conversation. When she returned she remarked, “Talking to them was like the start of an old joke.” “How was that?” I asked, certain that she was pulling my leg, “Well there was an English woman, an Irish man and me,” she said. It took me a moment to get it …. actually there was a Welshman as well. We’re here – we’re in France! The sun is shining and all is well with the world. Hope the next instalment of your journey is considerably more relaxed. I think Mary is getting used to the ups and downs of travel now – either that or she’s numb. We’re having lots of fun in between the challenges though. Glad yo see you back on the road ladies. Looking forward to more updates. We’ll be doing our first French trip next year so will be taking notes. Safe travels. Off again, glad to hear it, causing absolute mayhem as usual. We are away for October but would love to see you all if you are coming this far south or are returning via our way. Plenty of room for two more Moho’s. Aah Travel Lust here. But too busy for the moment for the ache to really set in. Tunnel Tip: go for a nanny nap, no point having a bed and not using it! Excellent customer service though. Last time our fridge opened in transit we had flying carrot soup! Good to read about your on your travels again. I’ve missed your sojourns! Enjoyed reading about your eventful journey to France, looking forward to more chapters. Hope Mary keeps her sketchbook for us all to see on her return, good to know she has experienced guides. Hi you two, or three, have a great time back on your travels, We await in anticipation your next post. Grant and I had a weekend at Dunbar again last weekend, were beginning to think Dunbar is a jinx for us, first time our ignition collapsed inside and we had to get help. This time while I was in bed first and our wee Jura, lying on top, Grant went to get in and Bang, the bed collapsed at his side 😂😂😂. He spent the nex day fixing it while I wandered up town 😅Oh well we enjoyed it. Isn’t motorhoming great fun, even with the joys of little mishaps. Oh love to the dogs. Collapsing bed! Oh no! Glad he was able to fix it. What a brilliant blog! Can I apologise for saying how much i enjoyed it , when it was full of woes! I look forward to the next instalment. Mary- your sketches taper going to be a great record of your maiden trip! A fabulous entrée to your next voyage and unexpected too! Cate to share your itinerary, however sketchy ..? Hi ladies, so glad to be reading your bog again and best wishes for your trip. We are probably a week or two ahead of you and also stopped at the pub in N Yorkshire, but try their steak pie next time. Home made and delicious, but huge portion. I also had the sticky toffee pud and it was fine, but cant comment on the rest. Lets hope you were just unlucky. Our rattle bang on the journey down( and just about Alnwick) was the end pipe of the exhaust. Bonne route! Great tip about the pie! Thank you. Definitely worth a second visit in such a handy place and such a friendly welcome. Hope your exhaust is now in full working order. Enjoy your trip. Love your blogs, so well written and entertaining. I am worried though that you have put a picture of your home on here and said how long you will be away for. You have also given details of the town … I’m sure I’m worrying unnecessarily for you but I would take the photo of your flat down.